Top 10 Best Pulse Oximeters in India - Buying Guide Best Fingertip and Table Top Pulse Oximeters - Top 10 In India - Only The Best of everything! LATEST product list, updates regularly! A Pulse Oximeter reads the oxygen level in blood by using a simple non-invasive technique. The pulse oximeter is placed either on a finger-tip or the ear lobe and by using a ray of red light and a ray of infra red light, it measures the oxygen level in blood. It gives a reading known as blood oxygen saturation level in percentage. The oxygen saturation is the proportion of oxygen saturated haemoglobin in a person’s blood compared to the total haemoglobin consisting of oxygen saturated and unsaturated. Normal healthy people have a pulse oximeter reading of about 97%. It is generally considered safe if the oxygen saturation levels are above 92%, but in a normal healthy individual the oxygen saturation levels should be anywhere between 95% to 100%. It is very useful for device that is now quite affordable and can be easily carried around as it has become portable. The pulse oximeter is used by healthy individuals and people who need it for medical reasons. Some professional sportspersons use a pulse oximeter to measure their blood oxygen level when they do very strenuous exercise, it is also useful for mountain climbers and those who do sports in high altitudes, where the atmospheric oxygen levels are lower. Anyone who is recovering from an illness or surgery may also need to monitor their blood oxygen with a pulse oximeter. The activity that a pulse oximeter performs is known as pulse oximetry, and pulse oximetry is a very important way of checking the health of people who have a medical condition that affects blood oxygen levels. Such conditions include heart attack, heart failure, anaemia, lung cancer, asthma, pneumonia and Chronic Obstructive Pulmonary Disease. Look for a pulse oximeter which has a easy to read and simple display screen. It is important for the pulse oximeter to be user friendly and easy to read and interpret. Some pulse oximeters even have a graphical representation of the reading for easier interpretation. It must be usable on both hands with equal ease. A compact portable design is an added advantage if you have to carry the pulse oximeter with you or use it at work or out of home. Thus an ideal pulse oximeter should be with minimum or no wires, be simple to use and easy to carry with you. It should not have any additional parts or components or cables for it to be used. All this will make it very easy for anyone to check the oxygen levels without any fuss, or the need to connect with other components etc. If you need to keep it with you while doing some activity, having a lanyard or strap to put around your neck will be a useful. With something as critical as blood oxygen level readings, it is absolutely essential for it to be accurate and very fast. The readings should be almost instant as it is important to instantly know the saturation levels. It is important for the pulse oximeter to be affordable, and thankfully due to technology advances the pulse oximeters are now available from just over Rs. 1000. 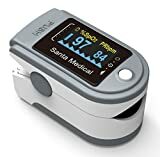 In fact the bestselling pulse oximeter is priced just around Rs. 1,300. Some pulse finger oximeters are as expensive as 10,000 or more, but if you are looking for a robust and good quality pulse oximeter that will do its job effectively, then the ones that come at around Rs. 1,500 are fine. Table Top pulse oximeters are more useful when constant monitoring is required. It has medical uses and is used in hospitals and when required in homes. Here are the best Tabletop Pulse Oximeters in India. This list of the top 10 best pulse oximeters in India features the top bestselling pulse oximeters in India. 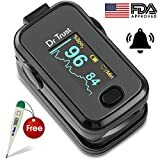 It is very important for you to read the reviews and make a careful choice as a pulse oximeter is a critical healthcare device. 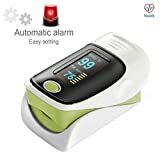 If you are buying it for a patient then it is recommended that you take your doctor's advise regarding which pulse oximeter to buy. If you are looking for the bestselling pulse oximeters then you will find them in the list below. Also this list is updated every day so you will find only the latest models of pulse oximeters here. Read all specifications and reviews before buying a pulse oximeter, after all someone's well being may depend on it. Top 10 Best Pulse Oxymeter in India – Buying Guide Finger and Wrist Pulse Oxymeters – How to choose. Daily updated Top 10 lists. Look, Choose, Buy Smart! DR TRUST USA NO.1 DOCTORS CHOICE: Measures quickly and accurately pulse rate and SpO2 blood oxygen saturation of arterial hemoglobin levels. 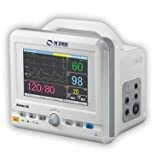 Accurately determine your SpO2 (blood oxygen saturation levels), Fast SpO2 readings, pulse measurements and display it conveniently on a large digital bright LED display. 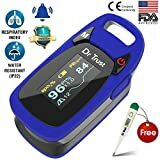 PRODUCT OF USA WITH WARRANTY IN INDIA: Designed and Engineered in USA :USFDA and CE approved Fingertip Pulse Oximeter, Neck/Wrist Cord, User Manual, 2-AAA Batteries, DR TRUST DIGITAL THERMOMETER MRP225 FREE plus our no-hassle 1 year extended warranty and friendly customer service. DOCTORS CHOICE: Measures quickly and accurately pulse rate and SpO2 blood oxygen saturation of arterial hemoglobin levels. Accurately determine your SpO2 (blood oxygen saturation levels), Fast SpO2 readings, pulse measurements and display it conveniently on a large digital bright LED display. ACCURATE: Rotatable multidirectional display, allows you to view your results in any direction plus Pulse wave, Pulse Rate, bar graph, SpO2 level and Battery level. PRODUCT OF USA: Designed and Engineered in USA :FDA and CE approved Fingertip Pulse Oximeter, Neck/Wrist Cord, User Manual, 2-AAA Batteries, thermometer plus our no-hassle 1 year warranty and friendly customer service. ACCURATE AND RELIABLE - Accurately determine your SpO2 (blood oxygen saturation levels), pulse rate and pulse strength and display it conveniently on a large digital LED display. Manufactured as per the standards for pulse oximeters used by doctors and other health professionals. The ONLY LED pulse oximeter that can read and display up to 100% for SpO2 value. SpO2 and Pulse Rate readings now face the user instead of away for easy read. Accommodates wide range of finger sizes. LOADED WITH ACCESSORIES - Includes High quality travel pouch, 2 X AAA Batteries that will allow you to use the pulse oximeter right out of the box, and a Lanyard to wear it in the neck for convenience. 1 YEAR WARRANTY: INDIVIDUALLY TESTED FOR ACCURACY: Each device undergoes rigorous testing and is approved for use by the FDA & CE carry 1 year warranty. Alarm Setting: You can customise and set your own lower limit of Oxygen at which the alarm beep function will start to alert you about the low oxygen levels. Type - Fingertip Pulse Oximeter; Certification - Approved by FDA; Ideal For - Adults/Pediatrics. FDA approved pulse oximeter is backed by state of the art technology. It features 6 display modes. Medical oximeter has HD LED display (2 Colors) and AAA batteries. Easy to use(One button operation); Strong slip Resistant Clip with soft Silicone Padding makes it worthy product to invest in. Pulse oximeter infant features Auto Rotate screen. Pulse Rate Range - 20 to 300 BPM; Oxygen Saturation Range 0 - 99% to100% Spo2. Pediatric oximeter features Low Battery Indicator, Alarm and audio alarm. Wavelength of LED - 660 660 Red Light; 940 940 Infrared Light. Pulse oximeter with alarm is durable and efficient to withstand years of use. Wavelength display clearly shows inconsistencies.